My definition of old requires simple math. Multiply your age times 2 and if you think you’ll live that long, you’re not old. At 58, I’ll be old on my next birthday. My great aunt, Gladys Degerstrom, survived her children and all her siblings, and has since passed, but 12 years ago we first met and Aunt Gladys was still sharp at 96. At the time I was tracing our family history and visiting Monson, Maine, where our ancestors first settled after arriving from Sweden in 1881. By chance, one person mentioned that a woman with the same last name was in a local nursing home in Dover-Foxcroft, so with my wife and parents we stopped by to visit. My grandfather passed away in 1953, and to our utter surprise this was his sister still doing well 43 years later, plus loaded with facts about our family history. Gladys Degerstrom was born in 1900. We first met in 1996, and she passed away 2 years later. Her stories of Growin’ Up in Maine in the early 1900’s were about going to church in a horse and buggy, walking to the one room school at the end of Degerstrom Road, and the joys of living on a farm with a large family. She was able to name two horses in an old family photo, Doc and Besty, and told stories of sneaking off with a blanket to take a nap in the hay next to one or the other. If you are interested in family history or genealogy, my advice is start looking around at the old timers in your family while they’re still kicking. Take notes while you can. 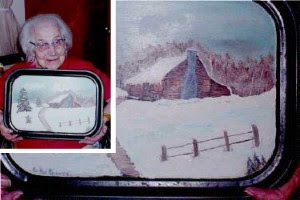 After that visit with Aunt Gladys, I was later informed by her grandson that the painting of the winter scene was her work, but it was painted two months earlier and not 80 years ago. To me, either date was equally amazing.